Sea level changes on short and long term scales. Over the short term, tides are the most significant change in sea level. Storms also affect sea level over the short term. 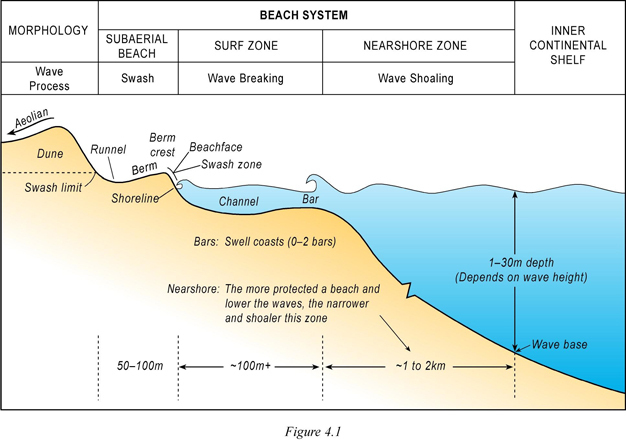 Coasts can be storm-dominated or tide-dominated, which affects relative sea level. Relative sea level is the position of the sea relative to the land. Land can emerge from or submerge into the crust, which affects how we view sea level. Emerging land makes it appear that the sea level is decreasing relative to the land, while submerging land makes it appear that sea level is rising relative to the land[2, pg 222]. These relative changes affect storm and tide sea level changes. The definitions of storm or tide dominated coasts are relatively straightforward: storm dominated coasts are controlled by storms and tide dominated coasts are controlled by tides. Storms and tides control sea level, as well as other geologic processes such as sediment deposition. 80% of coasts on Earth are storm dominated, 17% tide dominated, and the remainder is dominated by ocean current [2, pg 217]. The wave base at the bottom right of the image is where waves typically begin forming due to shallowing of the ocean floor. During a storm, this wave base is pushed closer to the coast, therefore "raising" the sea level temporarily. Recording sea level is important because that is how elevation and depth of the oceans is calculated. Scientists can also use sea level to keep track of how other climate factors are changing. Though natural global cycles contribute to sea level rise over long timelines, anthropogenic activity is speeding up the process significantly. The burning of fossil fuels and other human activities has lead to increased greenhouse gases, which accelerates the ocean warming. While melting ice does add water to the ocean system, this only changes sea level when the ice was previously out of water (i.e. landlocked ice, glaciers, ice caps) since ice takes up more volume than the water it contains. When seawater warms, the particles become more spread out due to the higher kinetic energy, and this increased volume causes the sea level to rise. The mean sea level of the ocean is measured over a long period of time, and may help identify effects of global climate change and the anthropogenic effects. Since 1900, the sea level increase has been recorded to be between .04 and .1 inches per year, while the increase since 1992 has been measured at .12 inches per year. This seemingly slight increase is quite large due to the compounding effects. Global warming has been affecting so many things from agriculture to marine life and the rising of modern sea level is a red flag that global warming is occurring. This can lead to a drop in available land space for human habitation, and may eventually cause flooding of islands and coasts.